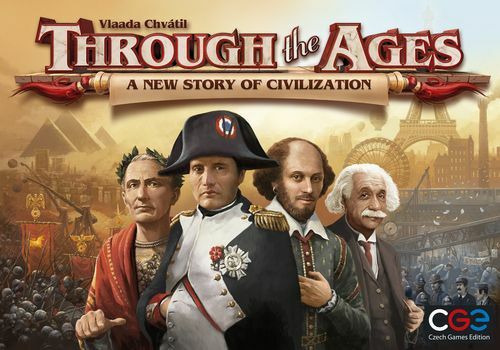 Through the Ages: A New Story of Civilization is the second edition of Through the Ages: A Story of Civilization, with many changes small and large to the game's cards over its three ages. One of the primary mechanisms in TTA is card drafting. Technologies, wonders, and leaders come into play and become easier to draft the longer they are in play. In order to use a technology you will need enough science to discover it, enough food to create a population to man it and enough resources (ore) to build the building to use it. While balancing the resources needed to advance your technology you also need to build a military. Military is built in the same way as civilian buildings. Players that have a weak military will be preyed upon by other players. There is no map in the game so you cannot lose territory, but players with higher military will steal resources, science, kill leaders, take population or culture. It is very difficult to win with a large military, but it is very easy to lose because of a weak one. THROUGH the AGES a boardgame for 2-4 players of 14 years and older by the prolific author: Vlaada Chvatil for Czech Games Edition CGE's Story of Civilisation from 2006 comes of age as a New Story of Civilisation in 2015 The latest version of THROUGH the AGES comes with two booklets; the 24 page Handbook and the 12 page Code of Laws. As I never played, owned or even saw, the 2006 edition I cannot compare anything from this edition and so this review is based solely on this, the 2015 version. The Handbook is the first book to read as it teaches new players how to set up all the numerous parts of the game. Twenty-four pages of any game are daunting but by taking your time you can set up the game and follow what is virtually a walkthrough for the first round. You should take these steps each time you play until you are happy and comfortable with the rules. For your first game, or if you are teaching THROUGH the AGES it is strongly recommended that you do not include the Military conflict option. You will have Military cards in play Apparently the rules in this book are compatible with the earlier edition of the game so if you already know how to play you can put this book aside and concentrate on the Code of Laws booklet. If you have played before and just need a quick refresher, the Code of Laws combined with the back page of the Handbook will provide it. In THROUGH the AGES each player has their own civilisation they are building. It is detailed on the mat they have positioned in front of them ; everything they do is on and around this play-mat, there is no actual game board on which all players act or interact. These mats have 5 cards printed on them, one (Red) for Warriors, two (Brown) for Agriculture and Bronze (Farming and Mining) and two (Gray) for Philosophy & Religion (Building Technologies). Below these the Turn sequence is laid out in progression and to the right of these is a sixth card, Despotism (Orange) which is your current form of Government. The next three parts of the mat are very important; they are where your Resources and Workers are collected – the Blue Bank (resources such as Food and Ore), the Yellow Bank (Happiness and eventually Workers) and the Worker Pool - from where you get Workers to place on the main cards. The Yellow and Blue Pools are not just simple holding areas, they are specifically set out so that as the representative blocks are removed (spent, as in placed on the cards above them) from them so problems, such as loss of Happiness, may occur. Thus you constantly have to balance your Workers and Resources ensuring you have enough Food to feed the workers who are creating the necessary goods and enough Goods to build Wonders (Hanging Gardens, Library of Alexandria, the Pyramids and the Colussus being amongst them) and spend to bring Cultural, Civil and Military cards into play. The cards on that begin on the player’s mats (these cards are printed rather physical cards) are Civil cards from Age A and there is another type of card, the Military cards. For each of the two card types there are three Age decks marked I, II and III on their backs. Your first game should be played without the III cards from both decks because they are more of a Military and Political nature. The game revolves around decision making. Players have 2 Military and 4 Civil Actions available to them each turn, though there are chances that this may change depending on how players employ their strategies. To keep note of which Actions you have used the 2 Red and 4 White cubes are placed on the Government card and removed as used, being placed back when the player resets for the next turn. Although the 6 Action cubes represent 6 Actions it doesn’t mean that the player will actually take 6 specific Actions. For example buying a card from the Card Row, can cost 1, 2 or 3 Actions depending on where the required card is located on the Row. The aforementioned Card Row is just as it sounds, a row of cards, 13 cards in fact, that are randomly dealt onto the row from the draw deck and replenished when the player’s turn is over. To make things a little spicier a couple of thoughtful additions have been made to the rules for buying cards from the Row. If there is a specific card you want and it is priced at the higher rate of 3 Actions you have to make the decision to buy it then and maybe not have enough Actions to complete your planned move for that turn or you can wait for it to slide along the Row and hope that it is still there when your next turn comes around. At the end of a player’s turn the cards on the row slide down, perhaps dropping into the next price range or perhaps dropping out of the game altogether – any cards remaining on the two card spaces farthest to the left at the end of the player’s turn are removed from play before the cards slide. Many is the time when I have waited for a card to droop into my price range only to see someone either buy it from under me or worse still I have to watch it slip away from me and over the precipice. Annoying and frustrating but a superb element designed to make you realise that if something is really going to be helpful to you then don’t waste time hoping to grab a bargain. Of course you should grab a bargain if one becomes available, but it is best to take advantage of such a possibility rather than try to orchestrate it and trust to luck. Speaking of luck, apart from the randomness of the Card Row there is very little by way of luck in the game, it is all down to selection and choice of strategy. Another example of this is when Leaders are available on the Card Row (and by now you must have realised just how significant the Card Row is). Each player can only have one Leader in play; if they buy another they have to discard the one they have in play. Leaders can be pretty useful as they each have a special ability or benefit that is only available once per turn. Therefore your choice of Leader can be crucial, again depending on your strategy. Leaders are well known names from ancient history, such as Julius Caesar, Aristotle, Moses and Alexander the Great. This is a large game, taking a good 2 hours for most 4 player games even after you know the rules. Thankfully beginners can learn as they play and the rules book (Handbook) is very well designed to this end. Now back to tactics and strategies. As I mentioned there are Warriors, Philosophies, Religion and Government. You begin with Workers on each of these except Religion and Government. Religion has to be bought into and by doing so you gain Happiness (Smiley-Faces) and Culture (Lyres) whereas Philosophy gives you Science and throughout the game you require Culture, Science and Strength as well as Happiness. The Government card (on the mat) begins as Despotism which gives you the Actions (4W 2R) that you can spend in your turn. When (or if) you manage to build your Civilisation you can change up to Monarchy (5W 3R), Republic (7W 2R), Constitutional Monarchy (6E 4R), Fundamentalism (6W 5R), Communism (7W 5R) or Democracy (7W 3R). Like the Government and Warrior cards on the board, the other cards can be upgraded and as you use more Workers it soon becomes essential to build bigger farms and deeper mines. To do this you must expand your technologies, gaining the Special (Blue) Tech cards such as Warfare, Code of Laws and Masonry by upgrading your Science rating (shown as Lightbulbs) on the Science track. Players have markers on three boards, two markers on each. There is the Science board and the Culture board each with two tracks, one that keeps note of the Rating and one that keeps note of the points – the Science and Culture points being gained according to their Ratings. Player’s also each have a Strength marker which shows their current strength for Military conflicts. On the same board as the Strength track there are three card spaces. The central of these is for the Current Events Deck where the cards are flipped to determine as they say, the current event (which affects everyone). Next to this deck is a space for discards and is known as the Past events space and on the other side of the Current events deck is the space for the Future events. The Future events deck is made up of cards played by the players from their hands, placed face down and ready to be shuffled and make up the Current events deck once the current events deck is exhausted – pretty clever mechanic that works well and fits in with all the other small but effective mechanics that make up this game. I mentioned Happiness earlier and this is required to ensure you have content workers. Discontented workers can prevent players having their Production phase and that can be a major disadvantage which might just end your claim to have the most advanced Civilisation. As in real life Politics can be the making or breaking of a Civilisation. Politics cards include Aggressions, Pacts, and Wars. Once these are brought into play Tactics come into play, again through the use of cards. Warriors can be augmented by Knights, Swordsmen, Riflemen, Cannon and other Army cards. These have their own strengths which can be added to by placing Workers, turning them into Army units. Also like real life, Politics and Combat can define the shape of the world and have a great effect on players hoping for a peaceful solution to success. An army’s tactical strength is determined by the current tactical card, the units on it and the worker cubes plus your strength rating. Combat looks like it is going to be complicated but it is actually another simple mechanic. THROUGH the AGES is one of the major recent successes in the boardgame fraternity and has been hailed as the new Civilisation (the AH version not the Sid Meier remake) or History of the World. I rate it in-between those two and think that players of those games will find it an interestingly different take on the building of a new world. There is very little you can say against it, should you want to, except perhaps that there are times when it appears that a player’s turn is laid out (as in determined) for them, in as much as their options have been diminished, sometimes by the choices of the other players during their turns and sometimes through the player’s inability to successfully manage their own resources. There is a lot that can be said for it, such as the elegance and design of the components, as well as the number of pieces. The artwork is exceptionally good and the subject matter, although not new, is one that whets the appetite of most European and Western core strategy and tactics boardgames players. As I said earlier, the game is not luck based, it is down to players controlling their own destinies, in the main. It is a decent addition to the 120 minute plus core-gamer style of boardgames and will have obvious appeal to collectors and fans of Vlaada’s style and approach to epic games. It also has playability and longevity.